In the late 40's and early fifties British manufacturers were aping American styling. The Rover, for example, resembled the Studebaker, the Jowett was inspired by the Lincoln Zephyr, and English Fords looked like smaller versions of their American cousins. 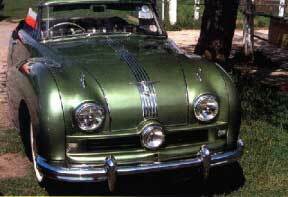 The result was the creation of the Austin A90 Atlantic. Austin's pitch to the North American market was offered first as a convertible with manual or power top, and later as a sport sedan. While not resembling any particular American car, it was clearly influenced by American design. It was attractively styled with its horizontal grille rather than the traditional Austin upright type, and its hood and deck lid were adorned with Pontiac-like chromed stripes. There was a "cyclops eye" spotlight in the middle of the grille, a la the Tucker, and the headlamps were located inboard above the grille. A flying-A Austin emblem was mounted on each fender above the headlights. The front fenders were somewhat bulbous, and the fender line swept back and down to the rear bumper, incorporating full rear-wheel fender skirts. The steep drop-off of this line always gave the impression that the A90's tail was riding a little higher than it should. The interior was nicely finished in leather and the four-speed transmission's column-mounted shift lever allowed three (friendly) people to ride in the front seats. The cozy rear seat was would accommodate two more. Power came from a 2.6 liter (2,660 cc) overhead valve in-line four cylinder engine equipped with two SU carburetors. It developed 88 horsepower, and was capable of accelerating the 2,800 lb A90 to 50 mph in about 11 seconds, and pushing it to a top speed in excess of 90 mph. While not tire-burning performance, it was quite adequate, comparing favorably with many contemporary North American cars. The chassis was conventional with A-arms and coil springs in front, and leaf springs and a solid axle at the rear. It rode on a 96 in. wheelbase and was 177 in. long over- all. The brakes, initially a combination of hydraulic and mechanical, were soon changed to full hydraulic. When the Atlantic arrived in North America, it made an auspicious entrance. An A90 was taken to the Indianapolis Speedway in April, 1949, where it broke 63 stock-car speed records. In spite of terrible weather, it covered 11,850 miles in seven days, averaging 70.54 mph. With attractive styling, good performance, and the prestige of its speed records, the Austin A90 Atlantic should have taken the North American market by storm. Unfortunately for Austin, it didn't. One of the problems was an initial price in the $3,000 range. For this amount of money buyers had the choice of such cars as a Buick or Mercury convertible, which were much bigger cars that cut a much more impressive figure to North American buyers. Although built to attract North American buyers, the A90 Atlantic never really caught on. It was continued until 1952, the year in which Austin and the Nuffield Group (Morris, et al.) merged to form the British Motor Corp. Total Atlantic production during its 1948 to '52 run was approximately 10,000. I personally don't know how may are left to this day but, the very nice specimen pictured here was taken at a Canadian car show in Toronto. While the Atlantic failed to bring the hoped-for hard currency to Britain, its engine, transmission and suspension would go on to enjoy much more fame than the A90 ever did. They would form the basis for the popular Austin-Healey 100/4 sports car, which appeared in 1953.